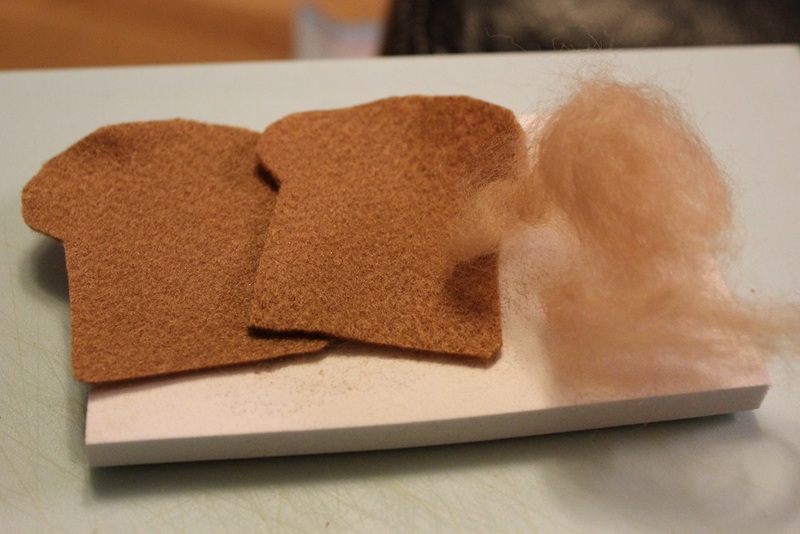 After completing the felted breakfast set I decided to move onto lunch and for lunch I made sandwiches. The lunch set consists of enough materials to make 4 felt sandwiches, including 8 slices of bread, 4 slices of ham 4 slices of turkey, 4 slices of cheese, 4 pieces of lettuce, 8 slices of tomato and 8 slices of cucumber (because my husband likes cucumber slices on his sandwiches). The insides of the sandwiches are mostly cut straight out of the felt without any embellishments and the most challenging parts to complete are the bread slices, the cuke slices and the tomato slices. All the individual ingredients of this set are different colors and shapes which adds to its value as a learning tool but at the end of the day it’s just play food. Really awesome, hand made play food. 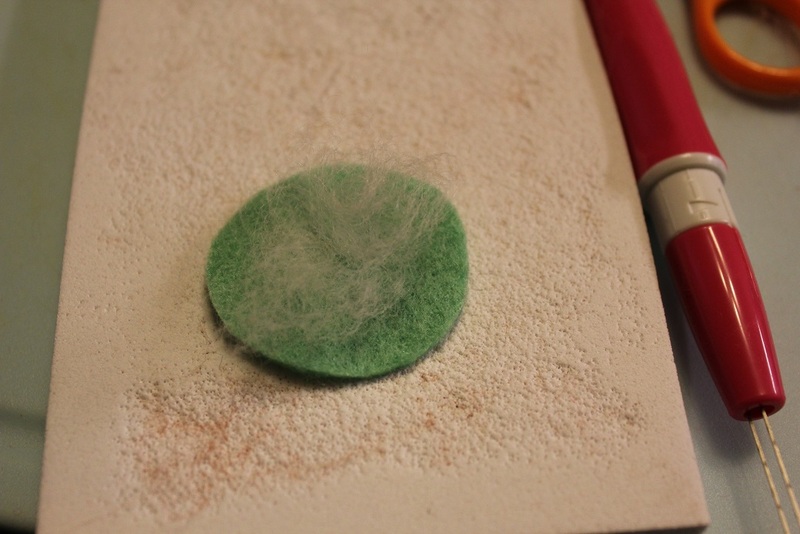 I’ve written the step by step process below assuming that the reader has a very basic understanding of felting. If you do not, it consists of a great deal of stabbing. A felting needle is a sharp needle with tiny barbs that thrusts fibers of felt and wool down into other fibers and mats them all together. The first thing I did was make up my templates starting with the bread. The bread template is traced from a piece of plastic bread that my daughter got for Christmas. The set only came with one piece of lonely bread but it’s really served a purpose in helping me to make her a whole loaf. If you do not have a piece of bread to trace for the shape is pretty easy to work out. The bread slices that I made measure approximately 3 x 2.5 inches and making the bread first is important because everything else you make should fit on the bread. I used things around the house for my circle and square templates. The meats are ovals which I created by joining two circles together and the lettuce were squares that I free hand sniped waves into the edges of. 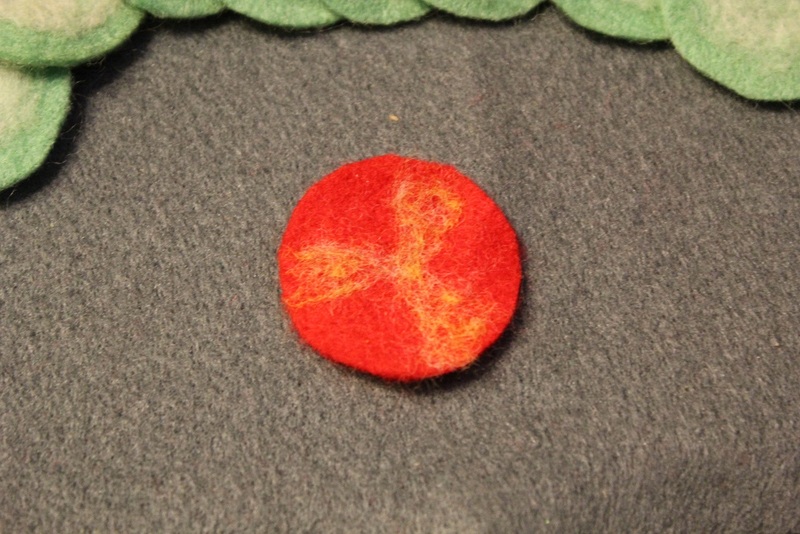 I cut out 16 bread pieces because the bread slices are made by doubling the felt. Everything else was in single layers so meat, cheese and lettuce were 4 pieces each and tomatoes and cucumbers were 8 slices each because one little tomato or cucumber would be lonely on a sandwich by its self so there are enough for two each… I may have slightly over-thought that part. The only things that I did any detail work on were the bread slices, the cucumber slices and the tomato slices. To make the bread just line up two of the cutouts and then place a tuft of the light brown wool on top. Felt the wool onto the bread pieces in a shape to suggest that there is crust all around the peremeter of the bread for maximum adorableness. 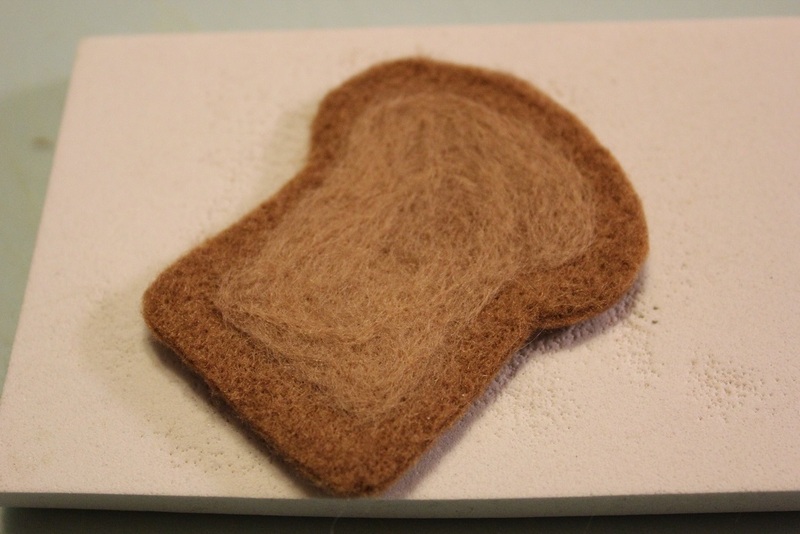 Then be sure that the rest of the bread is firmly felted together by stabbing it repeatedly with the felting needle until it all looks and feels like one piece. Anyone with small children knows that if they see a way to pull it apart, it’s coming apart… so basically, make sure you don’t leave any visual hint that might suggest that the bread could come apart and you’re golden. I made 6 of the bread pieces double sided and 2 of the bread pieces single sided so that the pieces all together would form a loaf with two heels. You do not have to do this, in fact, you could totally skip felting on the additional color too. I just enjoy working on the details. Next I moved onto the cucumber slices which were cut from a slightly darker green felt than the lettuce. All I did to embellish these was to apply a tiny tuft of white wool to the middle of each one and I needled it down into the felt. I was feeling a touch ambitious and made these double sided. Totally unessisary but as I said before… I enjoy working on the details. So that’s pretty much all of it. Once all the pieces are detailed and assembled you can make cute little deli sandwiches.